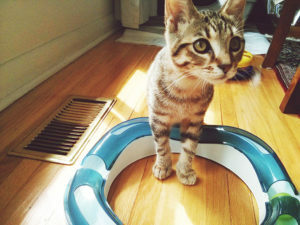 My love of feeding toys started with the Catit Design Senses Food Maze. I started using it with Avery not long after we first took him in as a kitten. Considering he ate so quickly, I was concerned that vomiting might one day become an issue. The feeding toy slowed down his eating to a speed I was happy with, and over the years has continued to help him keep a nice, slow pace during mealtimes. 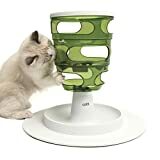 I still use the Catit Senses Food Maze to this day, and considering food as an intensive is one of the only ways to get Avery to successfully engage with a toy each and every time, I’ve always had a hankering to try out more products in the cat toy/cat feeder hybrid subsection of pet products. This Trixie Activity Center was the next item on my to-try list, though it wasn’t there for quite as long as you might think. 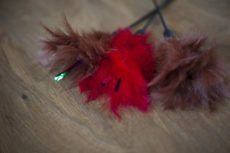 There’s a reason this cat toy hasn’t yet been reviewed, and it’s not because it doesn’t work, because I dislike it, or because I haven’t had it for long. In fact, it works well, I really do like it, and I’ve had it nearly a year now. So why haven’t I reviewed it yet? Plainly put: there’s been no review yet because I haven’t been using it. Why, again, is not a matter of any issue with the product itself. I can’t imagine a feeding toy more interesting or durably built. And it’s also better than the Catit Design Food Maze at a number of things. 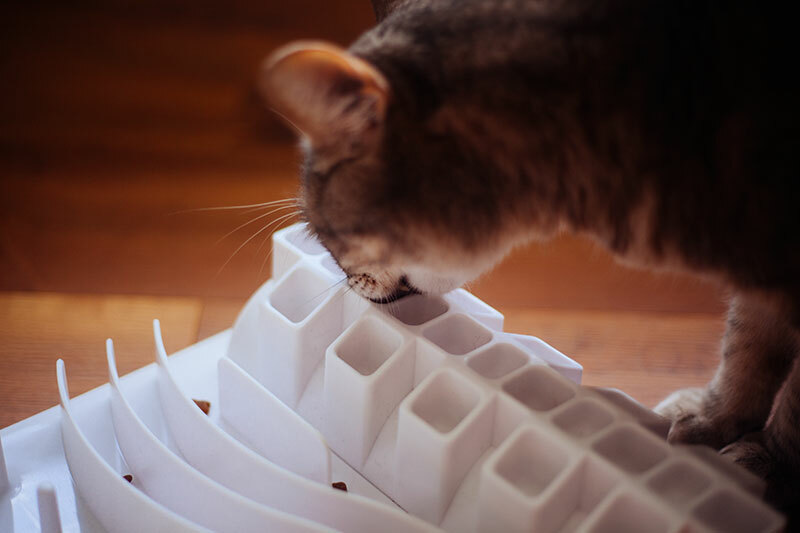 It’s better for those who feed a wet/dry food combination, and it’s got an amazing non-slip pad on the bottom that means it won’t easily move when your cat is using it (something the Catit Design Food Maze does quite a bit of). 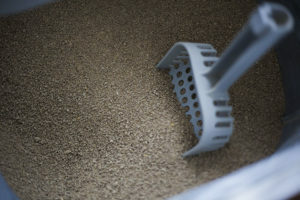 Why I dislike it is actually just a matter of how frustrating clean up of this product got to be for me considering a couple things: the dustiness of the spot I housed it in, as well as my use of a very crumbly kibble. The Trixie Fun Board is not (in my current situation) the easiest product to wash – not when you’re sporting quite a small sink. 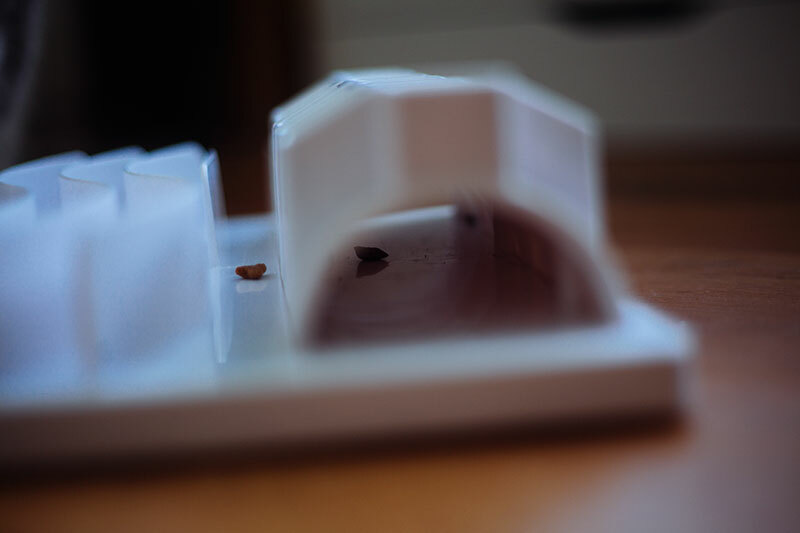 Granted, once I move into a house, these factors will be completely different, but here in our slightly-cramped studio flat, the Catit Senses Food Maze has edge enough in the stays-cleaner-for-longer department to make it the sole contender for a daily meal feeder at the end of the day. But more on this later. First, let’s do a play-by-play of all five different aspects of this activity center to see if it’s more up your alley than it’s been up mine. After that, we’ll get back into the overalls and when-it’s-better-than’s. 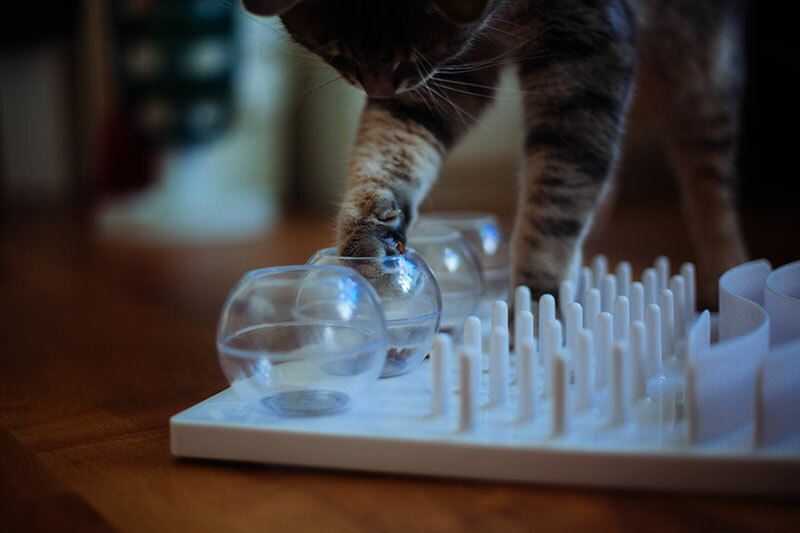 I’ll start with the game that’s, from what I can tell, the most difficult for all cats to use… Game 1: A globe that resembles a fish bowl that cats have to put their paw into and scoop treats out of. This thing is actually pretty awesome. Now, truth be told, I did think it would be a lot easier for Avery to get food out of this thing than it actually is. Out of all the games, this one takes up his attention (and concentration!) the longest. The angle the globe’s opening is at makes it really easy for a cat to drop the food back into the globe and need to reach in and try getting it out again. This means that even though Avery’s speed in completing most games on this activity board went from slow to super-quick in no time, this game still takes a considerable amount of patience and time on his part, and I imagine will never get easy enough to take him little to no time the same way Games 3, 4, & 5 have. I used to muse about the fact that if Trixie sold just these four balls on a platform/base, I’d probably buy it, as it’d be a really convenient thing to take with me to feed Avery in if I ever had to travel with him, or spend the night out with him someplace. I’d throw it in a bag with my trusty SturdiBox temporary litter box, some cat litter and some cat food in jars, and we’d be set. It’d be a lot better than just feeding him straight out of a bowl, and certainly easier than taking the Catit Senses Food Maze with me (not crazy enough to take something that big along). I’ve moved a lot with this cat of mine, so I do tend to think about these things a lot. 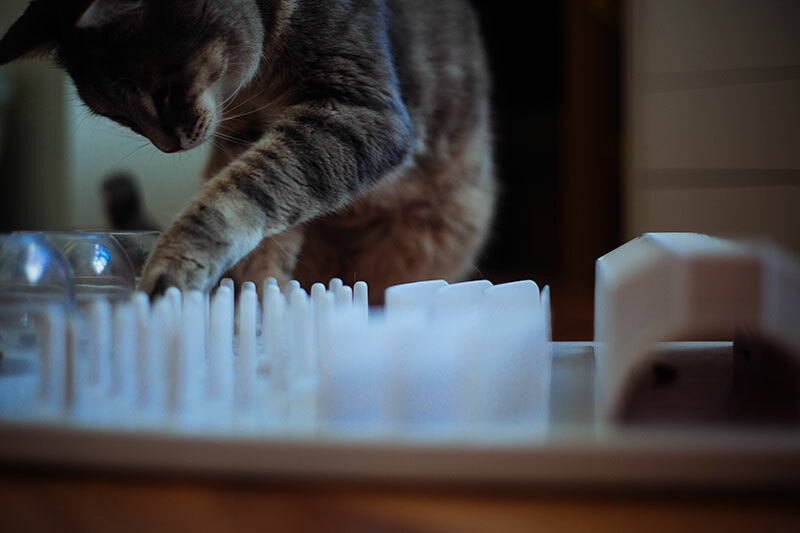 Onto Game 2: Pegs that mean kitty’s basically got to poke and swat at the kibble to get it out, since cat paws will just barely fit in between the pegs. 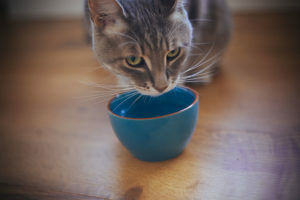 Not the hardest, but not the easiest because it’s (contrary to what I first believed) not possible for cats to easily slide food out of. This game makes Avery exceptionally concentrated as well. It’s probably the second hardest game, after the balls of course, which are super tricky. Doesn’t mean it’s not possible for a cat to master; Avery’s become a champ at this game board, and even after having taken months and months sabbatical from working at the Trixie Activity Center, he’s still got the hang of this peg game and finished it off without much effort or difficulty at all when I pulled it out for this review. 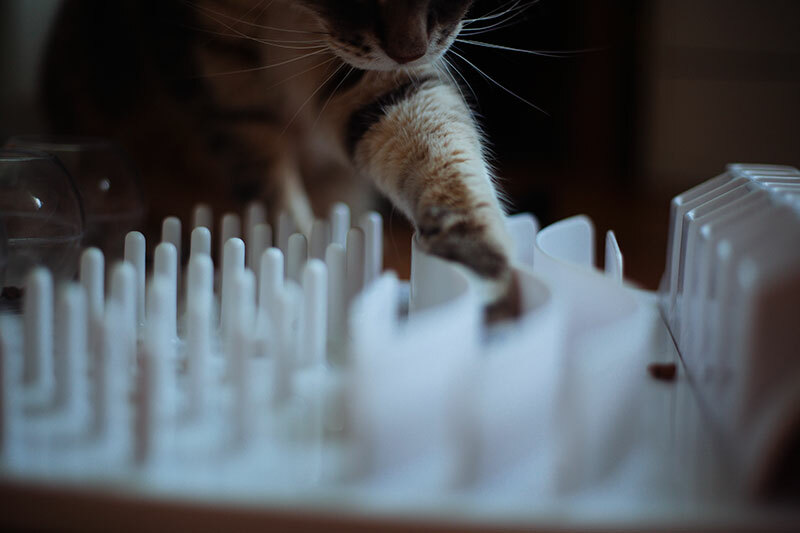 Challenge level for the peg game is around a 3/5, I’d say, not too easy, and not too frustrating for a cat either. Very interesting watching Avery navigate the peg game particularly since there are so many ways he can go about getting the food out, but he can’t just cheat and drag out the food. Sometimes when he pulls out kibble from Game #1, it “accidentally” falls into this game section, creating extra challenge and concentration since he’s got to transition from thinking about one type of game to thinking about another. Now on to the third toy, which is probably the easiest on the whole board. Visually, it looks like it’ll be a lot like the pegs, but since the pegs are so close together, it makes them exceptionally more difficult. This next one is faceroll easy for cats. Game 3: An alley that cats can place their paws into, then simply drag food out of. 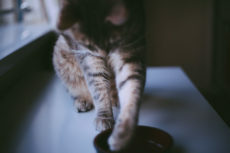 Since this game can be beat with a simple plop-your-paw-in-and-drag movement, there’s not much point in putting too much food into this section – your cat will get all the food there is out in a few fell swoops. 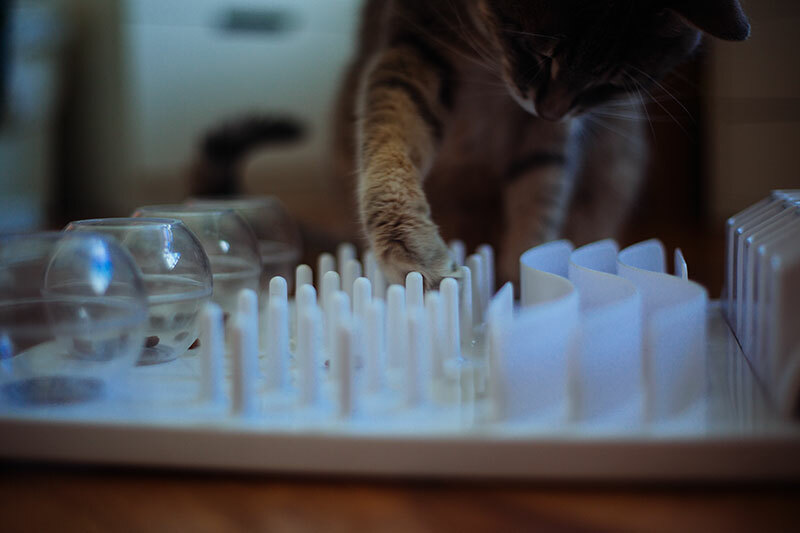 Still another cool toy, but if you’re looking to increase the time it takes for your cat to go through the Trixie Activity Center, you’d be better off putting the majority of the kibble in the first two games and leaving only a little bit for this one, as well as the last 2 games. Next is the game that tricked me initially! Game 4: A tongue game! Where slits are very narrow and so hinder cats from being able to use their paws to get food out. I honestly thought (when I first saw this toy and brought it home and OF COURSE did not read the instructions before placing it out) that this section was going to be about using claws to get the cat food out, and thus I thought it would be one of the most tricky for cats to use, but boy was I wrong. Avery figured this one out after some time trying to paw at the section the first day I had it out. After seeing him eat the kibble out, I promptly looked up the instructions and realized – yup! My cat is more clever than I. Anyway, so the instructions say it’s ideal for wet food. If I used a wet food/dry food combination, this would be PERFECT, but I don’t, so I put kibble in and he just licks it out. Kind of really annoying to clean by comparison to the other sections, and Avery eats kibble out of there like nobody’s business (super speed)! So when I first used this activity center for a month or two back when I first got it, I stopped putting kibble in this game completely after a while and just used the other games instead. And now for the final section… Game 5: A tunnel for hiding treats and toys. Well, Avery doesn’t care for toys so I’d just be using this section for treats. 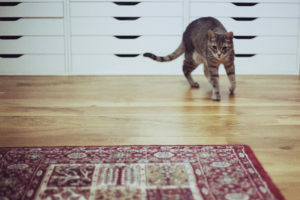 Maybe I’d stick in a mix to make it a little harder for him to get to the food, but definitely I would not bother to put in cat toys alone – not for my lazy cat. Is this the bast cat game on the board? Not really, considering how quick Avery manages to get everything in that tunnel out, but hey, it’s one more thing that helps make for a pretty interesting board overall, and helps keep my cat engaged for a lot longer than if he were to be eating out of a bowl. Now for the rundown. 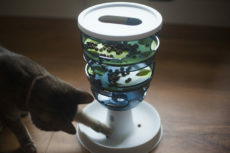 This product is awesome for slowing down a cat’s eating, but not as good as the Catit Design Senses Food Maze at that feat. 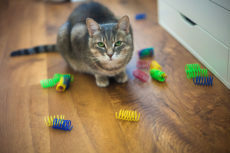 Were I to be choosing just one out of these two toys, if I was feeding exclusively kibble – it’d hands down be the Catit Food Maze, and were I feeding a wet/dry combination – almost certainly this toy. What about using them in conjunction? Exactly what I would recommend doing for those who don’t mind the extra clean up. 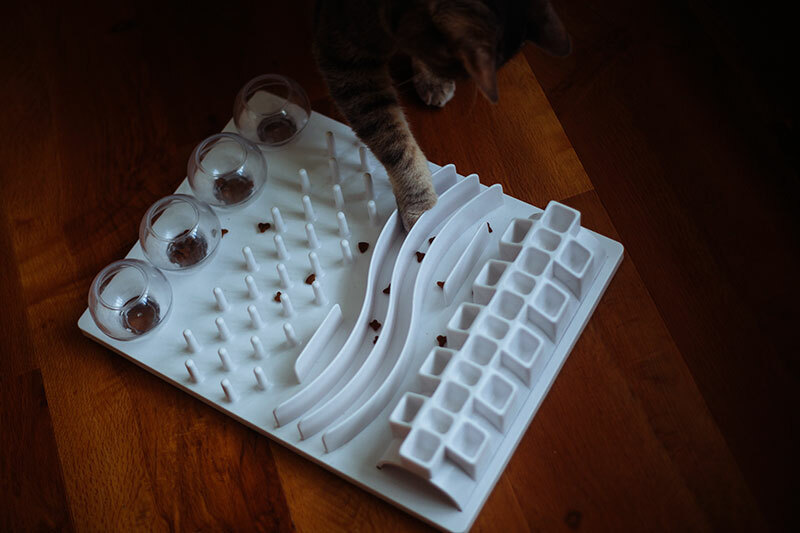 If you’re one of those people who, like me, likes to give your cats snacks throughout the day, I’d use the Catit Food Maze for regular meals and this board for snacks. 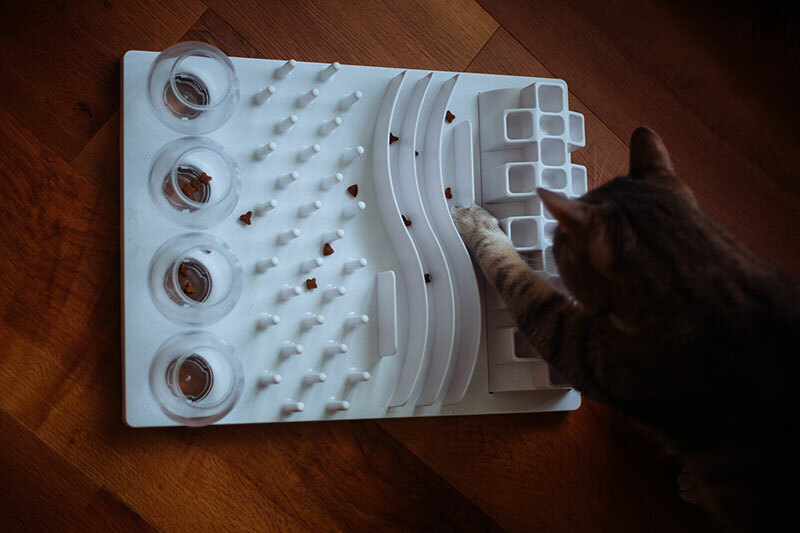 In my opinion, using this board takes a lot more kitty concentration, but putting in a lot of kibble into it is a tad pointless, especially when it comes to the last 3 games, so small snack portions really spaced out between the different games is ideal. Would I ever feed whole meals with this thing? Hell yes, and I did for months. And would have continued to do so happily if it was the only feeding toy I had. How long it takes Avery to complete it depends on just how hungry he’s feeling, but I do think he managed to finish this board in only around 10-20 minutes on days when he rushed. The more that’s in those globes/balls on the end, the longer it takes for him to finish, since those are the trickiest for him. 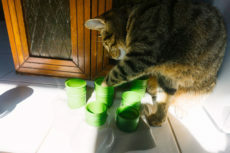 But overfilling those leads to him pulling out lots of kibble at once, so it’s definitely a better idea to feed bigger amounts in the Catit Food Maze (which is a consistently “slow” process of getting food out) and leave small snacks to the Trixie Activity Center. In terms of clean up: honestly, if it wasn’t for the size of my sink and the fact that even washing large pans feels cramped, this would be a non-issue. Those globes come off really easily when you want them to, and the toy is such thick, durable plastic it’d be difficult to break anything while washing. The Trixie Fun Board is also dishwasher safe (boy do I miss my dishwasher!) so if I had a house with a reasonable sized sink or even a dishwasher, none of my current complaints about finding this toy annoying to wash would be valid at all. If/when I do move to a house, if I decide to introduce some wet food to Avery’s diet, which I might, I will definitely be using this cat toy for Game #4 with that wet food. Only if I have a dishwasher that is. I’m still lazy and washing this by hand every single day is my idea of a nightmare. Yup, my cat isn’t the only lazy one in this household. Overall, the Trixie 5-in-1 Activity Center an excellent food toy, and I hope to get a lot more use out of it in the future. Is it the hardest feeding toy for a cat to use? Nope, even though you might expect it to be based on the way it looks. 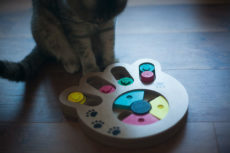 The first two toys are definitely the hardest, but even then, chances are quite good your clever little feline will figure this fun board out in no time at all, and race through it quite quickly to get that yummy grub. But it’s still a much slower pace of eating and is exceptionally more engaging for a cat than eating out of a bowl. I’d recommend using the fun board for snacks throughout the day more than I’d recommend it for feeding full meals, though it’s completely viable doing either. 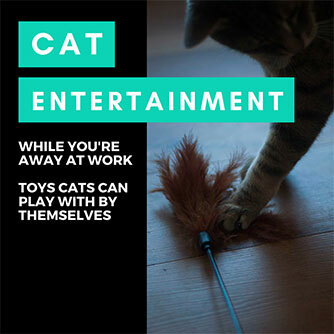 And if you feed dry and wet, Game #4 makes this one of the only cat toys on the market to make use of that wet food in a game/interactive setting. Wow how did we NOT know about your fabulous blog? Found you on Raena’s blog….we are now your newest followers! Nice to meet you! That looks like a fun interactive feeder, it would slow down Joanie. She eats fast and yacks it up often. Poor baby. 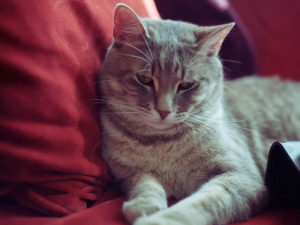 I feel for the kitties who just can’t help eating so fast – after all I’m not much different, haha. Food is awesome 🙂 Let me know if you give this or any other interactive feeder a shot with her. WOW, that looks like a whole lot of fun and my Sister Gracie would enjoy that!